Root canal therapy (also called endodontic therapy) is a procedure designed to allow a patient to retain his or her tooth after dental decay, trauma, or other factor has caused the nerve inside that tooth to become irreversibly inflamed and/or die. Drs. Nicholas and Carla Calcaterra routinely perform root canal procedures to residents of Orange, Woodbridge or other nearby towns in Connecticut. Treatment can be done with local anesthesia only, or Dr. Nick Calcaterra can do it with IV moderate sedation. Contrary to popular belief, root canals do not hurt. The reason root canals are associated with pain is because it is usually pain that causes the patient to seek dental care for that problem. The solution in many cases is to have a root canal performed. As a result, root canal therapy relieves pain and allows the patient to keep their tooth! Diagram of a tooth needing a root canal. Image courtesy AAE. In nearly all cases we see in our Orange, CT office, root canals are necessary when dental decay enters into the pulp tissue of the tooth. 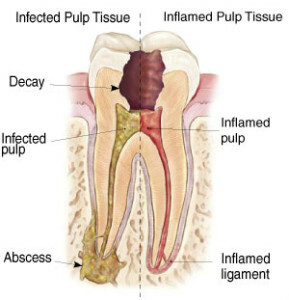 This results in either inflamed pulp tissue or infected pulp tissue. The patient will typically experience pain, sometimes quite severe, in the offending tooth. This then leads to a localized dental abscess. If untreated, the infection can spread beyond the tooth and into the bone and soft tissue supporting the tooth. Infections like these can be quite serious and require immediate attention. Endodontic treatment can also be necessary in cases of trauma, severely cracked teeth, certain periodontal infections, and cases of resorption. In root canal treatment, we first administer local anesthesia so you do not feel any pain. We then remove all the decay in the tooth and in the nerve chamber. We use special instruments to clean the root canal system so that it is free of bacteria and cures the infection. We then place a filling material into the root canal system to prevent an infection from recurring. 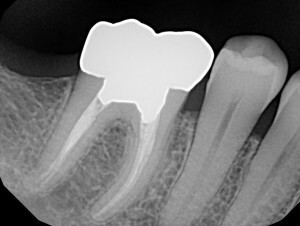 X-ray of tooth with a root canal performed in our office. This patient was from West Haven, CT. Resolution of a possibly life threatening tooth infection. Retention of the offending tooth! Drs. Calcaterra perform root canal procedures on patients in our modern and well-equipped Orange, CT office. If you are experiencing tooth pain, call us. We can nearly always accommodate same day emergencies. And we are one of the only offices in all of Connecticut who can perform root canals with IV Moderate Sedation. We employ the most modern technologies in our office, including TVs for patient viewing and digital x-rays.